Graced by a 'tree of life' that contains within it the 'candle of life', this elegant Ketuba is enhanced by the royal colors of gold and purple. Flowing from the tree of life are the Biblical 'fruitfull grape vines' that at the bottom of the design produce luscious fruit. The open blossom is a blessing for fecundity. 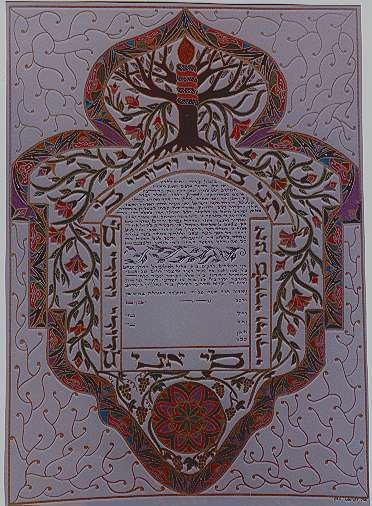 The text is surrounded by the Hebrew words from the Song of songs: "I belong to my beloved and my beloved belongs to me."